Groups, Clubs, Communities, Social Circles - Get your random questions here! 5 years ago (compared to now) were you a part or more or fewer organizations, clubs or groups than you are involved in today? Do you think people are more isolated today than they were five years ago? Has the internet made people more social or less social? I was running five programs/events of another organization and was President of that arts non-profit. The internet has changed the way people interact. There is much less face to face interaction. Even in my non-profit. We no longer have monthly Board meetings. We have two required real time Board meetings a year. All other business is done via email. There are no longer regular committee meetings. We have working project meetings when necessary. Friendships seem to be conducted via email - twitter - texting. This has opened a wider world of people to know. However, having been part of various groups that got together regularly for various purposes i miss the interaction. I miss the business done over coffee cups with papers all over the table in the back of a friendly restaurant. I miss the "day out" with friends. I miss the late night into the wee hours talks. 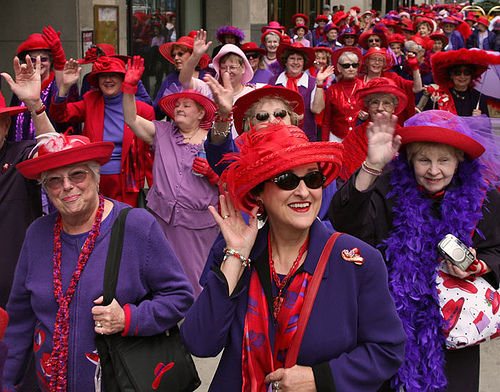 PS - no way in hell would i wear a red hat - or a purple outfit!!! This page was loaded Apr 26th 2019, 2:06 am GMT.